The Osiris Ranger is offered with both a proven Hi-res 640x480 DRS, 17μm VOx thermal module twinned with either an SD or HD video camera featuring a powerful optical zoom lens allowing the operator to both detect and then zoom into the area of interest. Both thermal and video outputs are provided simultaneously. The robust aluminium housings are rated to IP67 and are anodised and powder coated to withstand harsh environmental conditions. Optical encoders ensure positional accuracy and are allied to a self-correction system that will automatically keep the cameras in the desired position. 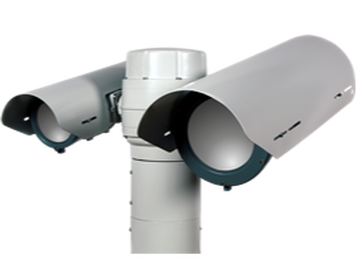 The unit provides absolute positioning feedback so it can be easily integrated into a larger security infrastructure and combined with radar or other detection systems.